The SD Association (SDA) has today announced its "revolutionary" SD Express memory cards, at the Mobile World Congress show in Shanghai, China. The new memory cards, part of the new SD 7.0 specification, leverage the PCIe 3.0 specification and NVMe v1.3 protocol to deliver the fastest memory card speeds and the greatest capacities yet. 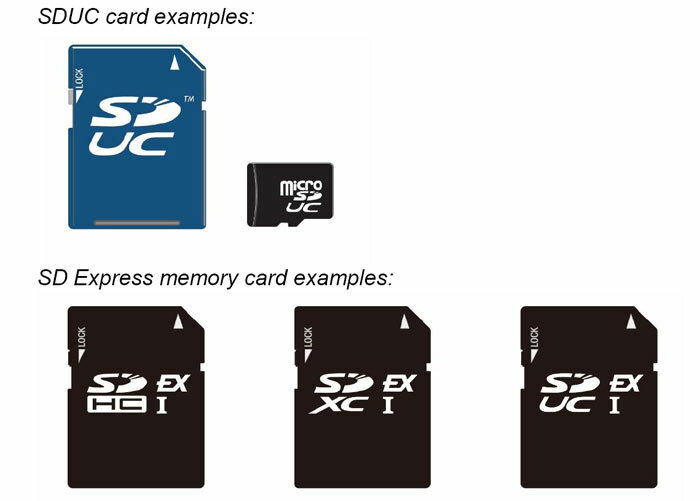 New SD Express cards will be capable of transfer speeds up to 985MB/s and in capacities up to 128TB. "With SD Express we're offering an entirely new level of memory card with faster protocols turning cards into a removable SSD," said Hiroyuki Sakamoto, SDA president. "SD 7.0 delivers revolutionary innovations to anticipate the needs of forthcoming devices and content rich and speed hungry applications." 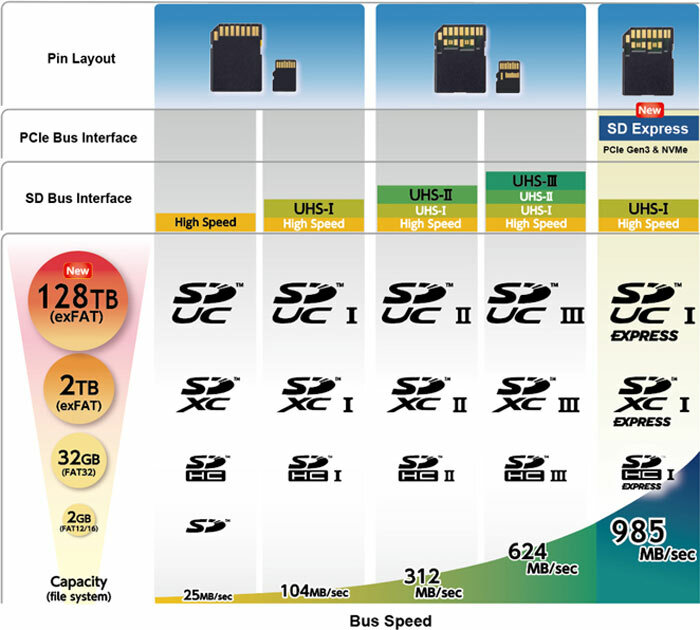 The SD Bus Interface specification has been continuously increased over the years from High Speed (25MB/s) to 3rd Generation of Ultra High Speed UHS-III (624MB/s). Now, the SDA offers SD Express, which uses the PCIe and NVMe Interfaces to deliver up to 985MB/s data transfer rates between SD host devices and memory cards. Furthermore top capcity has been given a considerable boost, from 2TB with SDXC to 128 TB with the new SD Ultra Capacity (SDUC) card. As usual, the SDA assures us of backward compatibility, meaning that any speed rated cards can be used in UHS-I, UHS-II, UHS-III and SD Express host devices but faster performance levels will only be attained when matching the card to the host device. Why would anyone need such fast and capacious SD cards? Every time the SDA boosts the standard it justifies it with use case examples. This time around it is easy for PC enthusiasts to see the appeal of what could be considered a 'removable SSD', as mentioned by the SDA president above. Other applications include; transferring large amounts of data generated by data-intense wireless communication, super-slow motion video, RAW continuous burst mode and 8K video capture and playback, 360 degree cameras/videos, speed hungry applications running on cards and mobile computing devices, ever evolving gaming systems, multi-channel IoT devices, and more. You can read through the SD Express press release and white paper (both PDFs), which are available from the front page of the SDA website, for further information. Heat dissipation will be interesting … the NVMe drive I upgraded my laptop with gets incredibly toasty in use (to the extent that if you configure the laptop with an NVMe drive from the factory it comes with a special heat shield). Seems a bit odd combining FAT and NVMe. Or is exFAT actually more than just expanding on the size limitations of FAT? Why don't they use a more modern file system on these cards? FAT was designed with mechanical HDDs in mind and NVMe is designed with solid state storage in mind, it seems to me that there is going to have to be extra fiddling along the way to make them work properly together which is sure to add latency? Please note that my username is “philehidiot” for a reason. I am a moron with a loud voice so feel free to point out how wrong I am. I … I honestly can't work out how to answer this. Basically, FAT was designed when there was no realistic non-volatile sold state technology. It wasn't designed *for* mechanical media as such. FAT has a number of benefits, including a relatively low overhead which makes it ideal for embedded systems and portable storage. exFAT is relatively modern (released in 2006) and was optimised for flash storage. NVMe is just a drive interface, like SATA/IDE/SCSI. It's not like you'd recommend a different filesystem because someone chose an NVMe SSD over a SATA SSD. The interface is irrelevant to the choice of file system - the use case is far more important. The lightness of FAT is a good fit for portable storage.